It's been a week now. We're past First Impressions. The dust is beginning to settle on the New Game Shine. Things are falling into a shape they'll hold for a while. It's still too early to stand back and take the cool view but one thing seems clear: Heart of Thorns may well be the best solo experience I've had in an MMORPG since Vanguard. This first week has, arguably, been a better solo experience than the base game at launch three years ago, strong contender though that was. That's mostly because GW2 was wildly popular when it first arrived and "soloing" meant trying to get a hit in alongside the other fifty new players in your new starting map of choice. Here the world seems much less crowded and not just because of the Megaserver bug that left some maps almost empty for the first few days. There's still plenty of rolling bubble play, if that's what you want, as Endgame Viable accurately describes. I've done some and loved it. It's GW2's signature gameplay after all. In a week where I've played almost all the hours available to me, though, zerging and massive-scale events have been merely the amuse-bouche to a banquet of top quality solo play. This, I recognize, is not an opinion universally acknowledged. 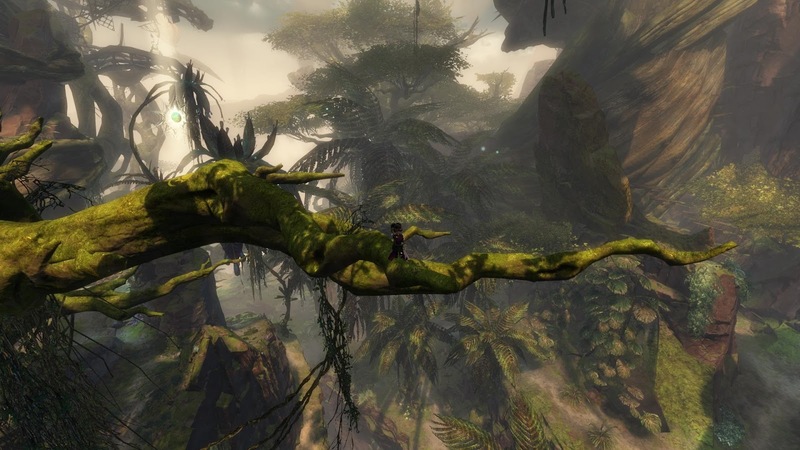 As I mentioned once before, MassivelyOP's GW2 columnist Tina Lauro adjudged soloing in the expansion "exceptionally difficult", an assessment some commenters on this forum thread would consider wildly optimistic. So, why the extreme difference of opinion? Well, as usual. it all comes down to a definition of terms. To me, "soloing" in MMORPGs means having complete freedom to do whatever I choose, while having that choice meaningfully progress my character. It means walking out of the city gate into adventure, alone, and returning, who knows how much later, still alone but stronger, wiser, battle-scarred and proud. To others, it seems, "soloing" means being able to do all the things without anyone's help. That's not a definition I'm willing to embrace but I'll accept right now that, for those who do, Heart of Thorns is not ideal. Alone you won't complete many events and certainly not any full event chains. You can start all the Hero Challenges you want but you won't often finish one on your own. Everywhere as you go there will be many times you'll have to run rather than stand and fight. Then there's the question of class. 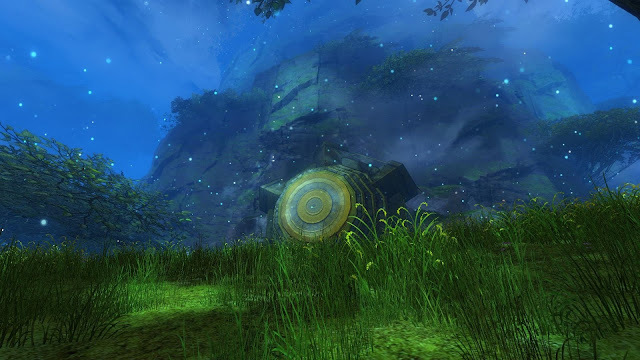 It can't be denied that some GW2 professions (and builds) are better at going it alone than others. My Berserker Staff Ele is out there trying to prove otherwise but she's not making a great case so far. Don't laugh. Spiky doesn't like it when you laugh. I knew that from beta though and as the drop date drew near I looked at my extensive team and made a specific choice of who would take point. 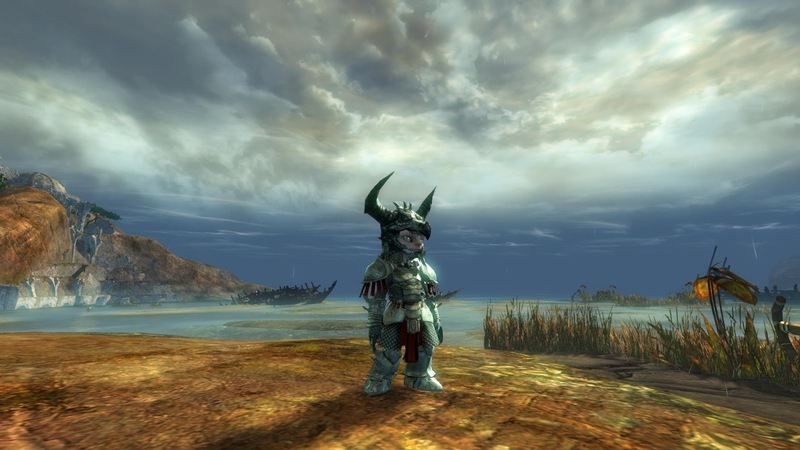 A while ago, for my own amusement, I created and leveled an Asuran Ranger who, at 80, I specced and equipped for maximum healing and survival. He can barely shoot his way out of a paper bag but he can take a licking like Timex. Until last week his main role has been comedy relief but cometh the hour, cometh the cat hat. He's been a superlative choice and he's not even a druid yet. After preparation add experience to the mix. I've been soloing a long time. I cut my solo teeth in EverQuest back at the turn of the century. Maybe it's first love syndrome but for me EQ, these days usually cited as the archetype of Group Required Gaming, has always represented the apogee of solo play in a massively multiple setting. Vanguard perhaps surpassed it but only by being EQ in fancier pants. The transferable skills you learn, soloing in EQ, are manifold. Patience, foremost. Pacing. Observation. Attention to your surroundings. Forward planning. Concentration. How to kite. Most importantly of all you learn to fear death. Dying in EverQuest, back then, hurt. A single death could wipe out all the progress you'd made in a full session. More. At worst it could cost you not just your level but your corpse and everything on it. All those hours quad-kiting Ulthorks had to pay off sometime. There are those who claim they want those days back but I'm not one of them. 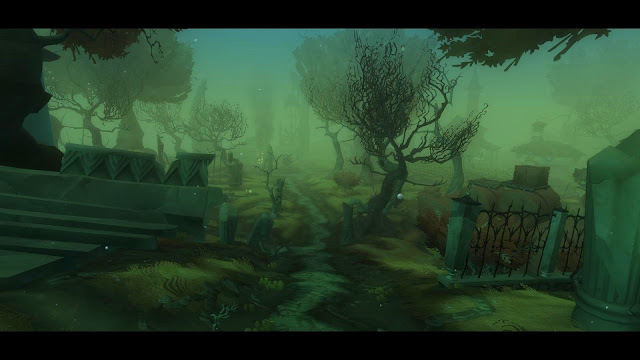 Compared to the "good" old days Heart of Thorns is cake but still, compared instead to much we've come to expect of late, it feels unforgiving. It's unbending, uncaring and harsh and at the same time refreshing, exhillarating, even thrilling. It's a precarious balance but I believe ANet nailed it. That said, the decision to open with perhaps the most awkward and un-navigable of the maps to travel without the new movement skills could be called perverse. Verdant Brink is an entirely different proposition with several ranks of gliding, jumping mushrooms and Nuhoch Wallows (they provide instant cross-map teleports) unlocked but players come to it blind, with none of that. As an introduction to the new paradigms it's intense, overwhelming, and it's not surprising many balked. The intent seems to have been that we'd work our way diligently through the Personal Storyline as though it was some kind of hyper-extended tutorial. That way we'd open all the relevant skills as and when we needed them but, well, best intentions and all. The decision to lock story chapters behind Masteries was widely perceived as coercive, restrictive and downright frustrating, second only in unpopularity to locking the new Elite Specializations behind 400 Hero Points. We're all Commanders of the Pact, for Dwayna's sake! We don't need our hands held. Just let us have it all and have it now and we'll have at it. Up or Down? Flip a coin. Both of those mechanics have since been mildly nerfed but perhaps, as Pact Commanders, we should just have buttoned up and buckled down. There is a war on after all. In any event it was mostly moot for me. I haven't touched the Elite Specs yet. My trusty Exotics and familiar skills seem more than up to the new challenges and by the time my Personal Story reached the second map, Auric Basin, I'd opened waypoints all the way to Mordremoth's doorstep in Dragon's Stand. Exploring is bittersweet sometimes. The storyline kept giving me reveals I'd already discovered. I knew the fate of Rata Novus days before it was explained to me in cut scenes and dialog. I could have told Taimi what we were walking into and saved us the trip. Still and all, I feel more connected to the narrative, not less, because I found my own path. As well as the feasibility of travel and the viability of combat solo there's the matter of grind. Those who aren't enjoying HoT and even some who are put the need to grind xp for Masteries high among the negatives. It's a position for which I don't feel a great deal of empathy. There is no agreed definition of "grind" in MMORPGs and there never will be. One person's content gate is another's content. What's hair-pulling frustration for him is a warm, relaxing bath for her. That's per kill. And I don't even have everything running. Familiarity is part of it. To many GW2 players these mechanics and processes are either something they've never encountered before or, worse, that they have and which they came to GW2 to escape. To me it's like meeting an old friend in an unexpected place. In three years I've acquired a lot of "Boosters". Those little icons that pop out of chests and fill my banks, stacking up unused because until now I've had no call for them. Why would I need to boost my experience gain when xp already flows faster than I can find a use for it? So I saved them for a rainy day and now it's monsoon season. Once again it's all so reminiscent of EQ or EQ2. Piling up the buffs, Birthday, Celebration, XP, food, utility, fireworks (yes, fireworks buff xp) then going hell-for-leather after anything that moves. Just watch that xp fly. It's so satisfying. Exhausting after a couple of hours, sure, but in the way a really good workout is exhausting (not that I can remember what that feels like...). Grind? More like glow. The expression "overgrown housecat" comes to mind. Did I say going after anything that moves? That's not right. We're back to knowledge and observation again. Satisfying soloing rests on knowing your enemy, setting achievable goals and picking your targets. In a new environment that means experimenting and that's a big factor in the fun I've been having. A lot of my time has been spent not just exploring for the sheer spectacle but for potential future profit. Each new creature needs to be tested to destruction - its or mine. That's how you learn that some Veterans are very much not like the others. Why Veteran jungle Spiders and Tigers are so pathetically weak I can't explain but they are. Take them three or four at a time. The xp tastes good. Chakk, while deadly if you stand still and let them cover you with icky blue goo, are the kobold grunts of Tyria, rounded up and AE'd down. Motile mushrooms, on the other hand, are to be avoided at all times. There's no percentage in AEing an AEer, especially when they come in gangs with bombs. Hop it, hat boy. It's necro time. And so it goes. You pull, you fight, you assess. At need you retreat. The glider here is a lifesaver, literally. Every drop is a zone line. Fall, unfurl, escape, start over. And the upside of gliding down is often landing somewhere no-one's been for a while. Untouched mobs in GW2 accrue a bonus that builds and builds. With boosts, killing mobs no-one had disturbed for a good while, you can rake in more xp in one ten-second kill than you get for Gold contribution at the end of a ten minute event. So, yes, this is solo heaven. For me, anyway. It can be for you. Pick the right class and build. Take your time preparing. Explore until you feel you know how the land lies. Learn your escape routes. Practice your tactics. When you feel ready go to your selected kill zone, pop those boosters and kill, kill, kill. It's a classic interpretation of the MMORPG solo experience and classics never go out of style. By far the most frustrating thing about Heart of Thorns is having to choose between playing it and blogging about it. Since I wasn't expecting to like it all that much and since I also expected it to be very buggy for a good while after launch I thought I'd probably regret taking even the one day of vacation time I tagged on to the weekend to give myself three days to try it out. Well, now I wish I'd taken a week. It's been very irksome, having to go to work every day only to spend most of the time daydreaming about playing. The last time that happened was probably the original launch three years ago. By the time I get home the last thing I want to do is spend a few of my precious play-hours writing about playing. Except that's also exactly what I do want to do. There's just so much to say! But not tonight. In preparation for the upcoming #IntPiPoMo (which, if you haven't heard about it, you can get up to speed at Gamer Girl Confessions) I thought I'd just throw out these pictures of the utterly unexpected and deliciously delightful Jamming Frog. The entire world as we know it is about to be plunged into oblivion, all sentient races either annihilated or enthralled by the dread dragon Mordremoth. The massed armies of the civilized world have been routed, their fleet destroyed, their forces scattered or killed and what do we get? A frog that invites you to choose some chords and settle in for a jam session, that's what. Seriously, this is why I play these games. Which is exactly what I'm off to do right now. Thankfully I have a four-day weekend coming up. Maybe I might even find time to do something other than explore. 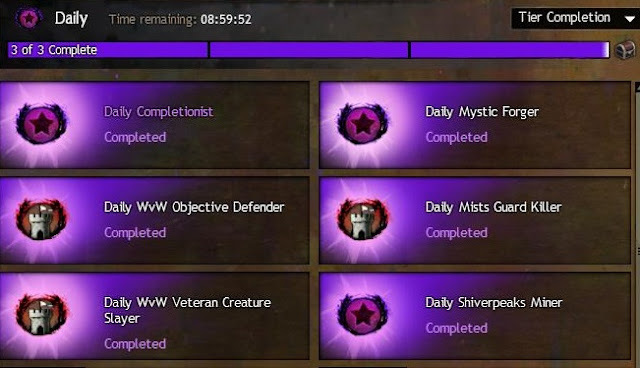 When I said yesterday that there'd been a bit of grumbling about the grind needed to open Elite Specializations I may have been guilty of understatement. Just a tad. The thread on the topic on the official forum is currently clocking in at fifty-seven pages with nearly three thousand comments and more than seventy thousand views. It's not unusual for the GW2 forums to blow up over some perceived injustice, of course. More like business as usual. Even so, a rebellion of this magnitude is hard to ignore. ArenaNet have made some effort of late to show willing when it comes to engaging with their public over contentious in-game issues. It's perhaps harder for them than for other game developers because of the strict policy of "we don't talk about what we're doing until we actually do it" that they've employed for as long as anyone can remember. "While we never like to rush and make snap decisions, in particular with a game that’s basically been out less than three days; I think there are some fair points in here for us to discuss. Much like other feedback about HoT, we’ll be discussing this as well!" So, expect a row-back on difficulty or a reduction in requirements or possibly even the conversion of the entire system from Character to Account Based. Conceivably all three at once, I guess. It's always a difficult balancing act. The expansion has, as Colin says, only been out for a weekend. New content in MMOs almost always seems a lot harder when it first drops than it will ever feel again in the lifetime of the game. Without making any changes at all, things that seemed impossible yesterday will most likely look manageable by next week and downright easy by Wintersday. In some ways it might be more logical to open with a lower level of difficulty and tweak it upwards as players gain knowledge and their characters gain power but MMOs rarely take that risk. Few players respond well to having the edge taken off their swords. It leaves developers trying to present content that isn't off-putting now yet will still have some appeal throughout the months and possibly years before it's replaced. Don't fancy that job much. In this case, however, while the "difficulty" is part of the issue (Hero Challenges in Heart of Thorns are, by and large, not soloable) the real bone of contention is content gating. A lot of people - and judging by that thread it really is a lot of people - were under the impression they'd bought new Elite Specializations they could use right away. They weren't planning on having to explore their way across several very confusing, and dangerous new maps to find twenty or thirty Hero Challenges before they could fire up their Scrapper or Chronomancer and take it for a run. It seems many of them were kind of planning on making that the first thing they did after HoT finished patching so having to wait hours, let alone days or even weeks has come as something of a surprise. There are those who just power through, naturally. By Saturday word was that it took around nineteen straight hours to grind out the points for one full Elite Spec. Obsessive, yes, but at least once it's done it's done, right? Well, not if you happen to have one of each class, which quite a few players do. Or more than one. 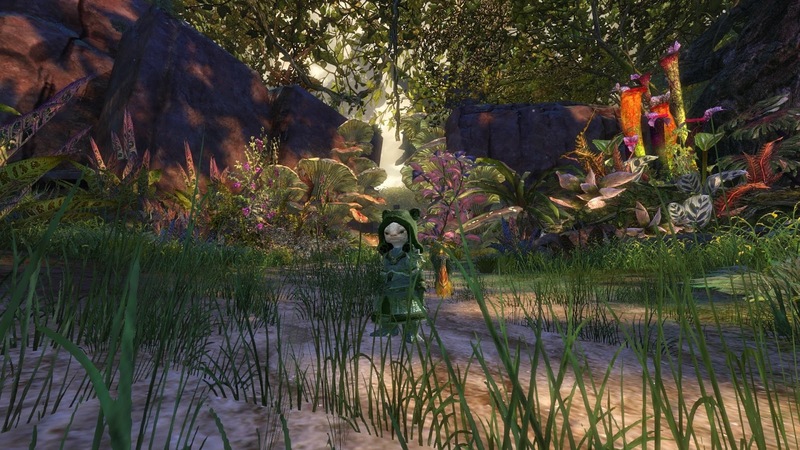 GW2 has been famously friendly towards those who like to make lots of characters. With a level 80 of each of the nine classes just getting Elite Specs for all of them while playing a generous thirty hours a week would take something like a month and a half if that's all you did. And to add insult to injury you'd have to do the exact same content all nine times. Clearly that's a worst-case scenario but it points up the core issue: the Elite Specs are gated behind repetitive content. 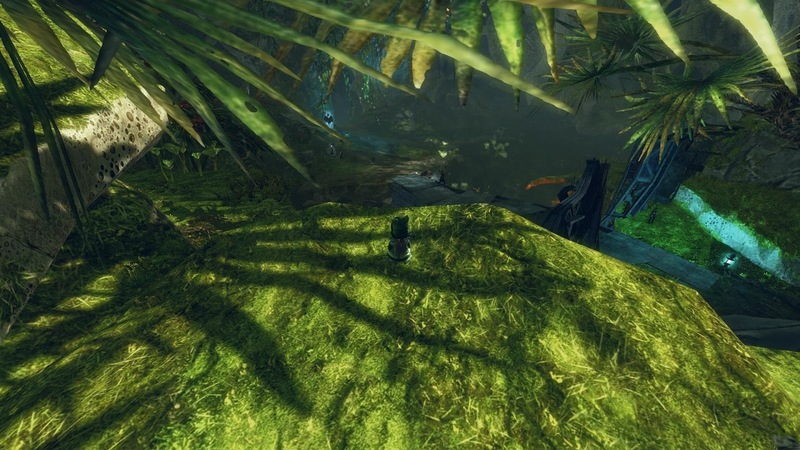 That's not an image that fits GW2's supposedly open, jump in and play playstyle. Heart of Thorns is big on gates. This is just the squeakiest. 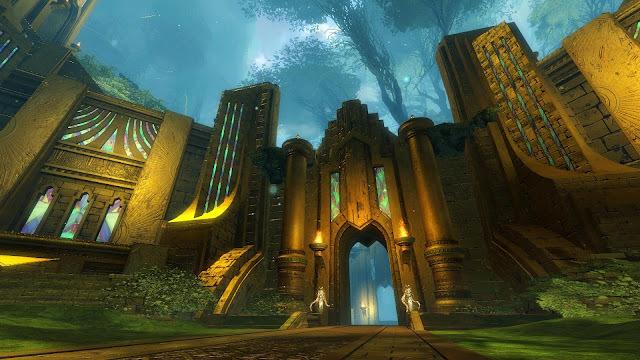 Raids, we hear, will be gear-gated, and the storyline is gated by Masteries. That's mildly annoying although it makes some kind of internal sense. The idea is to introduce players to the various skills and concepts they'll need to explore the open maps, also gated by Masteries, by building them into the stages of the Personal Story as it crosses the landscape. That has the side-effect of predicating which Masteries a player chooses to open, which is unfortunate to put it politely. 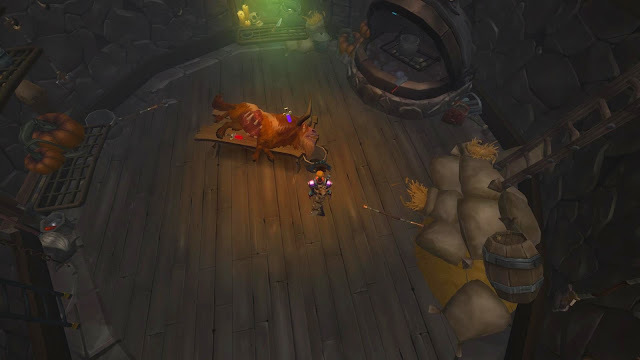 For example, I would have preferred to train Glider to V before starting on either Nunoch or Exalted Lore but at the grindingly slow pace they unlock to do so would mean leaving the story for a week or two. Chances of avoiding spoilers by then? Slim. Not to mention that the story is actually rather interesting and I'd like to follow it to the end before I forget what happened at the beginning. It would have been better in retrospect to have given the player character these abilities, temporarily, as they entered each instance that required them. That would have had the dual benefits of introducing the skills and creating a desire for them yet leaving it to the player to allocate his or her priorities and time outside the storyline. I do believe these design decisions, which must be difficult to make at the best of times, have been taken with the best interests of the players in mind. Often players really don't have the clearest view of what's good for the long-term health of the game. Although it's true that there's a commercial requirement to keep people playing I don't really buy the argument that the motivation behind all this is based on stretching a small amount of content out for as long as possible. Nevertheless, while the intention may have been to introduce people to the new movement and language skills gently and steadily and to make opening the Elite Specializations meaningful and satisfying, the effect has been almost the reverse. That's dangerous. Angry players who feel they've been short-changed or tricked don't make the best long-term customers and they certainly don't make good advocates for the game. It may be true - I think it probably is - that there are far more players playing and enjoying HoT than posting angrily on the forums but those players aren't the ones making the news. Therefore it looks odds on that HoT will get easier sooner than the developers intended. The Countryside Code says you should always "leave gates as you find them" but Tyria's another country altogether. Let's hope they do things differently there. At times yesterday both map and guild chat (yes, I'm now in a large guild with actual people - more on that another time) rumbled with discontent. The key complaint seemed to be the amount of grind required to access Elite Specializations and Masteries. 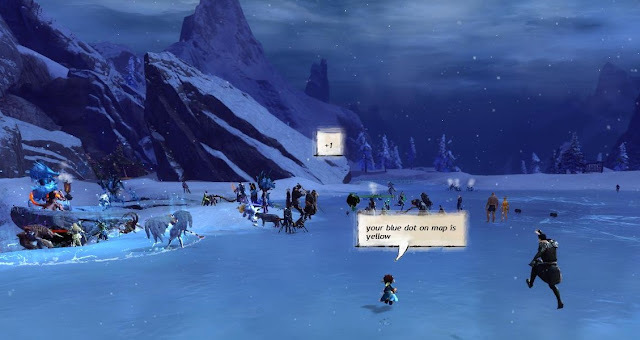 Most of it was the low-level grumbling of people who accepted they had to eat their greens before they could have their ice-cream but some of the angrier and more intemperate voices went so far as to suggest ArenaNet were guilty of bait and switch or even flat-out mis-selling. I'm not going to endorse that point of view. It seems to me that most of the surprise, even shock, at what the expansion has brought came from people who'd paid little or no attention to anything other than the features that took their fancy. 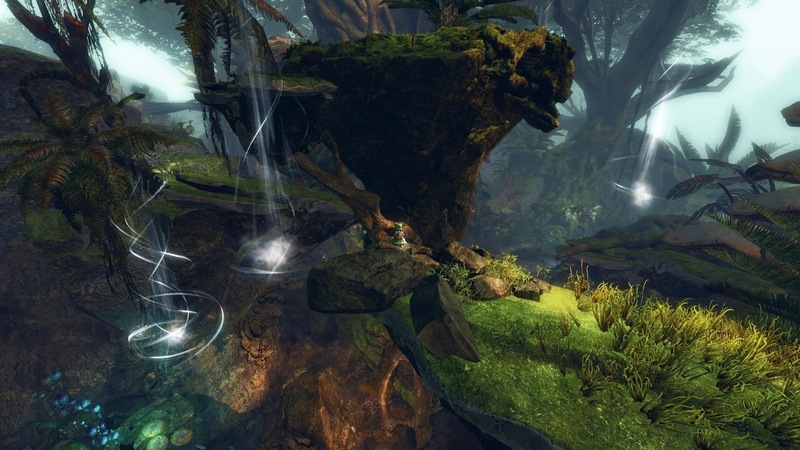 That the new skills and abilities were linked tightly to a new progression ladder had been made abundantly clear so there's no real excuse for blaming ANet for deliberate obfuscation. On the other hand, I do have some sympathy for the players who feel they've bought something that doesn't quite match their expectations. I have to say that I thought I was paying very close attention during the long, long build-up and yet Heart of Thorns is almost nothing like I thought it would be. For one thing IT'S NOT A FRICKIN' JUNGLE!!! Seriously, I don't like to yell, but really! The choice of a jungle biome as the backdrop for GW2's first expansion was probably the single most off-putting aspect of the entire affair both for me and for Mrs Bhagpuss, to the point that we had to grit our teeth and convince ourselves it wouldn't be as bad as we imagined. Well of course it's not as bad. IT'S NOT A JUNGLE! It's a FOREST! Anyone can see that. It has massive, plainly deciduous, trees! They look like oaks and redwoods. It has bosky paths strewn with leaves and grassy glades with shade-dappled lakes and ponds. It's not a jungle just because you put some tigers in there! For another thing, and I won't yell this time, it's really not that hard. 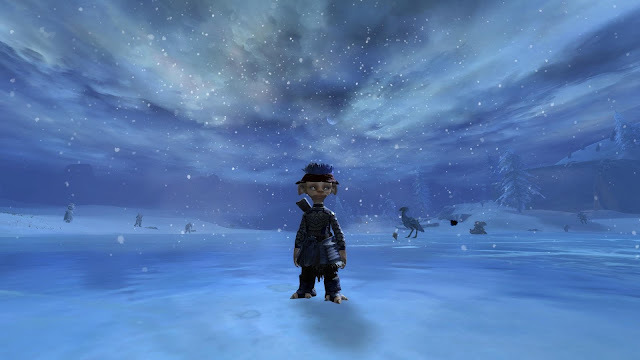 Tina Lauro, MassivelyOP's regular GW2 columnist, was, I thought, lukewarm on HoT in her first impressions piece. In a bullet point baldly titled "No Soloing" she stated "Soloing is exceptionally difficult in the new zone and is close to impossible during certain events". I would have to disagree almost completely with that description. It simply doesn't match my experience at all. I played for over a dozen hours yesterday, almost all of it in the new maps. I roamed and explored my way through Verdant Brink into Auric Basin and down to Tangled Depths. I wanted to get to the southernmost map, Dragon's Stand, but I didn't make it quite that far. During that long and extremely entertaining ramble I was often alone. As I explored I fought the things that wanted to kill me and some that were just minding their own business, too. Mostly I won those fights but if it looked like it wasn't going to go my way I ran. Often I ran to a cliff, threw myself into space, unfurled my wings and glided to safety. Or more trouble. One or the other. If I ran into events I attempted to do them. If I came across Hero Challenges I took them on. In almost every case, before long, other people turned up and joined in. Sometimes just one, sometimes a trickle, very occasionally a whole zerg. Because this is GW2. That is what soloing is here. 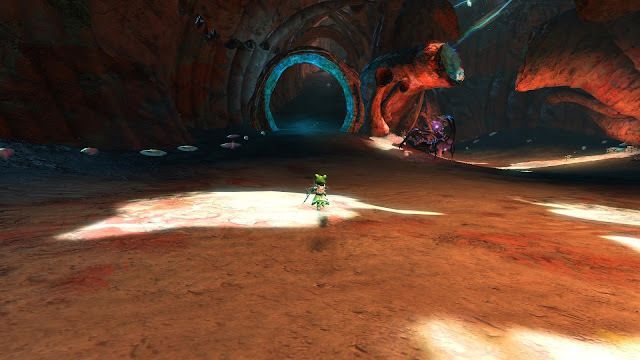 Soloing in GW2 is not "I hate people! I do everything meself, me!". Soloing in this game is mostly about not being in a formal party but being aware that you're still in a shared world, where someone will most likely be along any minute to give you a quick rub and get you back on your feet or throw a few fireballs over your head at whatever it is you're fighting. I remember Orr at launch. Before the first, let alone the second (or was it third?) difficulty pass. These new zones don't hold a candle to Original Orr in terms of difficulty and what's more important they are nowhere even close to being as frustrating, annoying, irritating and downright unpleasant. I realize Orr had its fans but the general view at the time was hostile to put it mildly, which is why so much got changed. 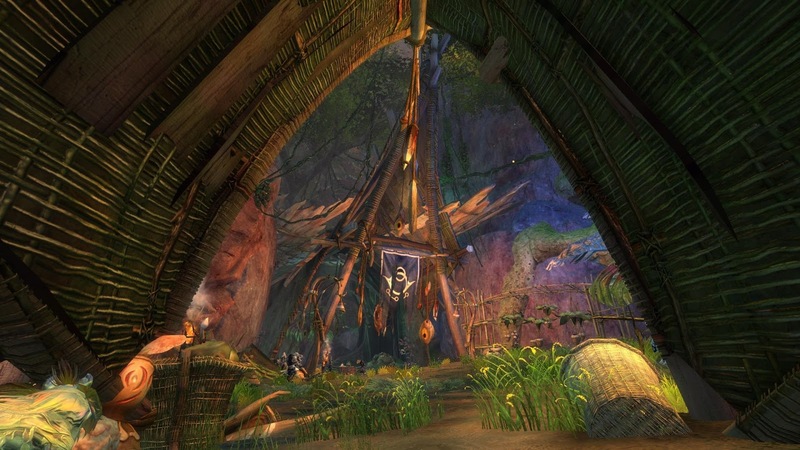 And let's not forget Southsun Cove. The first new map added and how solo-friendly was that? Even today it's a place no-one much goes without a group or better yet a zerg. No, the thing about the new Heart of Thorns overland maps is that they are an absolute explorer's paradise. Which, in my book, makes them perfect for soloing. Exploring is best done solo. Exploring with a partner is non-optimal but exploring with a group is just a recipe for arguments and disaster in my experience. Also for laughs and great anecdotes but most of that comes only after everyone's calmed down and got their cool back by doing something else. 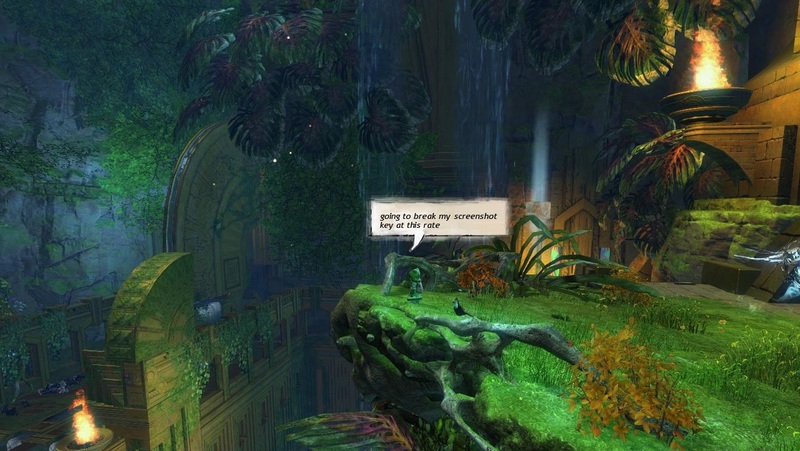 To be fair, ANet did tell us this. They said the gliding and the jumping mushrooms would seem natural, gaining the masteries to use them would feel organic, and the verticality would make exploring a joy. They told us the event chains would bring the "jungle" to life and immerse us in the lives of the creatures that lived there. I didn't believe them. I apologize. It was all true. Well, true enough. That's why I'm a satisfied customer right now. For once I'm getting what I want. It feels these maps have been made with my playstyle squarely in mind. Instead of Achiever maps with a nominal nod to exploring these are real, explorable maps with a few lifebelts scattered around for drowning Achievers to cling to. Given the sheer complexity of these three-dimensional spaces I wonder whether the Achievers will ever be able to codify and organize them. So far it feels nothing at all like Silverwastes or Dry Top. Maybe, in time, there will be taxis on the LFG rank for the meta-events but unless the easier pickings elsewhere are nerfed to unprofitability I tend to doubt it. 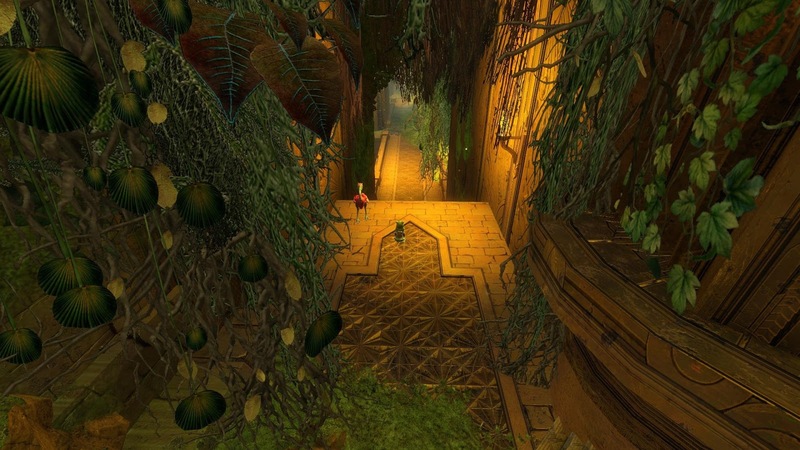 On the contrary, I wouldn't be surprised to find much of the new land opened by Heart of Thorns underused, even neglected in a few months' time. Perhaps even a few weeks. People often say they want things to be more challenging but in the end they often cleave to convenience and even with all the Masteries I can't see anyone ever calling these maps "convenient". "Could be worse. At least I'm not in a JUNGLE!" It seems idle at this late stage to speculate over what Heart of Thorns might or might not include. After all the thing's going to drop on us in less than 48 hours, whereupon all will be revealed. (There's no such word as whenupon, is there? There really should be). Still, idle speculation is a hard habit to break and in any case I'm not sure I'd want to try. I'd rather indulge, frankly. So let's away. I gave it just a passing mention earlier but one of the many undiscussed details is what will happen to Achievements. I suppose you could argue there's no particular reason to think anything's going to happen to them, of course. You could very well take the total silence on the subject for an indication that the status quo will roll on as before and maybe it will. 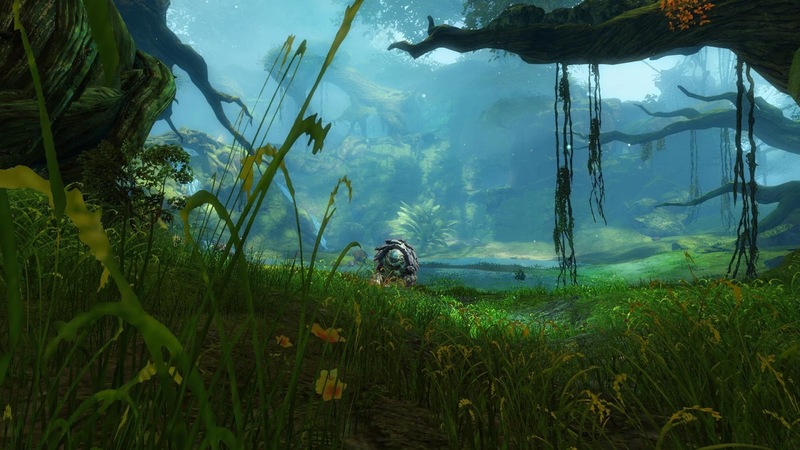 Achievements and the associated points and rewards have, however, been a very large part of GW2's core gameplay for almost the entire three-year life of the game. There's even a whole leaderboard dedicated to achievement-based epeen-waving, for heaven's sake. Given the attention, indeed prominence, previously allocated to the mechanic you might very well have expected it to feature heavily in the promotional build-up yet as far as I can tell it hasn't gleaned a single mention. In game it's possible to look 2,000 points ahead so I can see as far as the 17,500 milestone. The current board leader sits at just under 30k AP. Does the breadcrumb trail lead on forever? Whether or no, the supply of points dries up eventually beyond the trickle from dailies and the like. If HoT comes with the traditional full fat AP for map exploration and new content completed built in then a lot of people are going to get a huge leg-up the ladder. Since most of the rewards add meaningful percentage increases to basic account functions like rate of xp, gold and karma gain, could someone have spotted a potential problem with turning on a firehose of new achievements and decided it would be better instead to turn off the flow altogether? Apart from forming something not far short of the spine of the game itself, Achievements were one of the lynchpins of the Living Story. The way they were used was tweaked between Season One and Season Two to add a supposed level of replayability to the packaged, instanced content we got second time around. But then, the Living Story itself is another of those previously indispensable core features that's gone mysteriously missing. Since Season Two ended there has been not a word about any further episodes. Instead, all the attention has passed to the continuation of the Personal Story which, together with the narrative woven throughout the rest of the expansion, appears set to carry the storyline on to its conclusion. 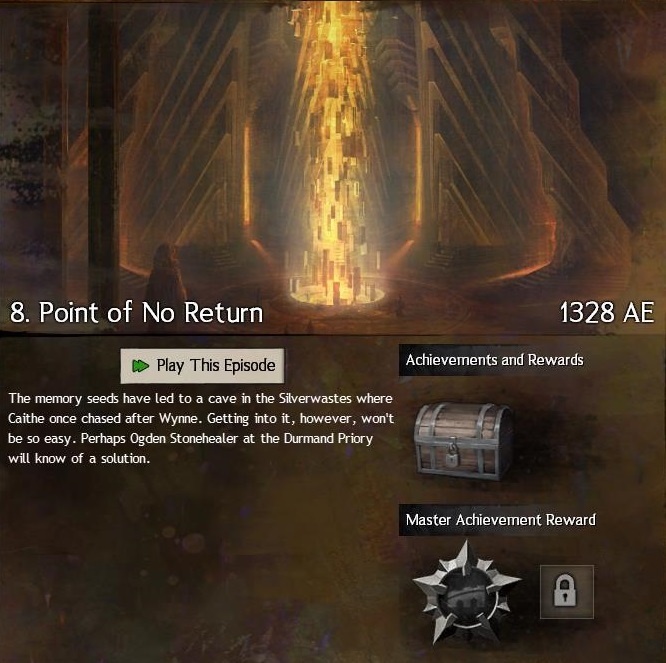 My feeling is that the Living Story experiment is over and ANet are hoping that if no-one mentions it the players will forget it ever happened, what with the excitement of an expansion and a raft of massive and disruptive structural changes to keep them occupied. Instead we'll get some kind of nebulous, ongoing Living World (not that they're calling it that, as far as I know). In other words the same thing every other MMORPG has been doing for years. It was while I was researching these absences that I came across the following direct quote from Colin Johanson embedded in this Eurogamer interview from January. "We will never add more levels to the game, we will never add more tiers of gear to the game. 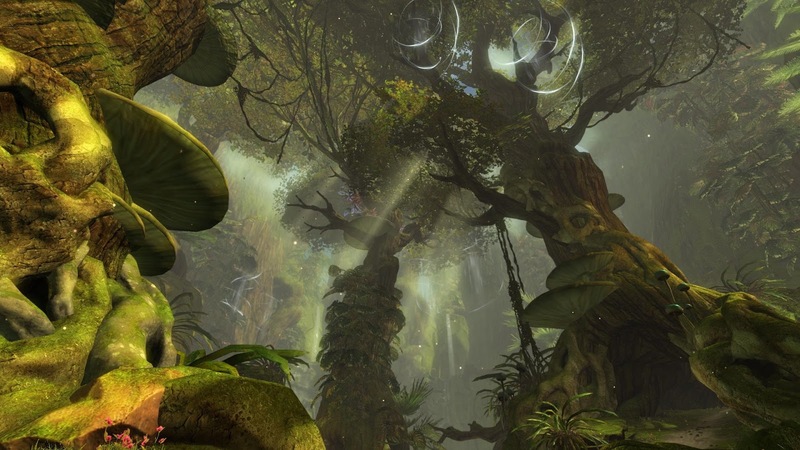 The tiers and levels we have today will be the tiers and levels we have for the rest of the life of Guild Wars 2." That sounds like the death-knell for my long term interest, then. If I can never level up again and never improve my gear I'm all the more likely to end up wandering off to somewhere where doing either or both of those is still a thing. Oh, maybe it doesn't mean quite what it looks like it means. 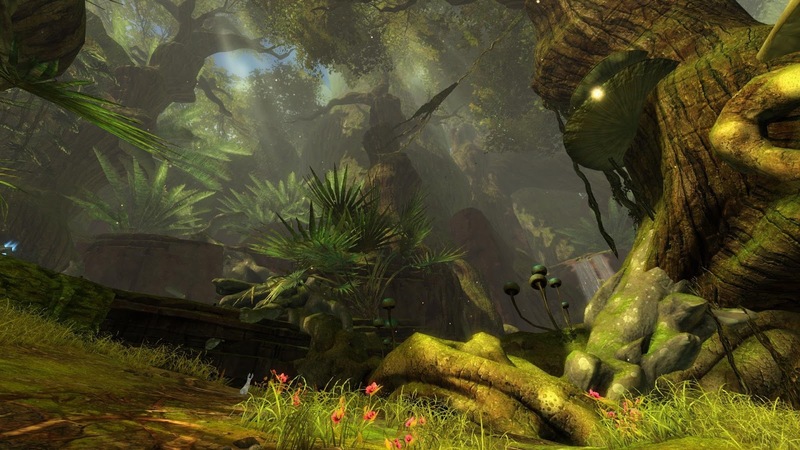 Maybe it really means they don't plan on keeping GW2 running for very much longer. If they already have another project or a sequel in mind then naturally they wouldn't need to plan for the progression of their old game. And indeed I have seen players speculating in-game about the likelihood of a GW3. Guild Wars ran for seven years before they mothballed it and GW2 took some five years of that time to develop. If they are planning a sequel they'd probably already have started. 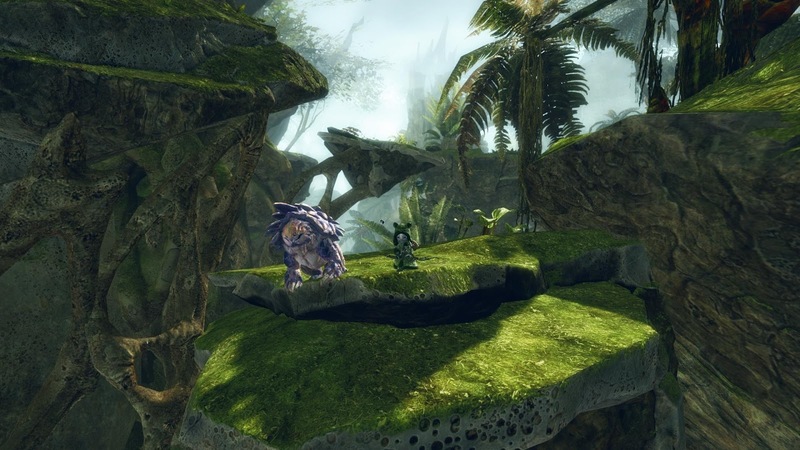 And even if they have no intentions of making another Guild Wars game, GW2 has taken three years and then some to get to its first expansion. If it takes as long again to get to the second then it'll have lasted longer than its predecessor. Maybe it will be about ready to be pensioned off by then even if there's nothing coming up to replace it and at such a glacially development pace I guess there wouldn't be much point planning for new levels or gear tiers. It's more likely they're planning on running one of those MMOs that never ends, like Lineage or EverQuest but I wonder if that's a realistic option for post-WoW MMOs? Does that level of franchise loyalty still exist in the genre? And if they are thinking along those lines then maybe they should have stuck with the original. MMO sequels, especially sequels with the numeral "2" appended, don't seem to have that great a commercial track record, after all. Oh well, just some idle speculation and conspiracy theorizing for a wet Wednesday afternoon. The week before the expansion comes is always a bit of a silly season. Because the rest of the time we're all always so frighteningly rational, aren't we? 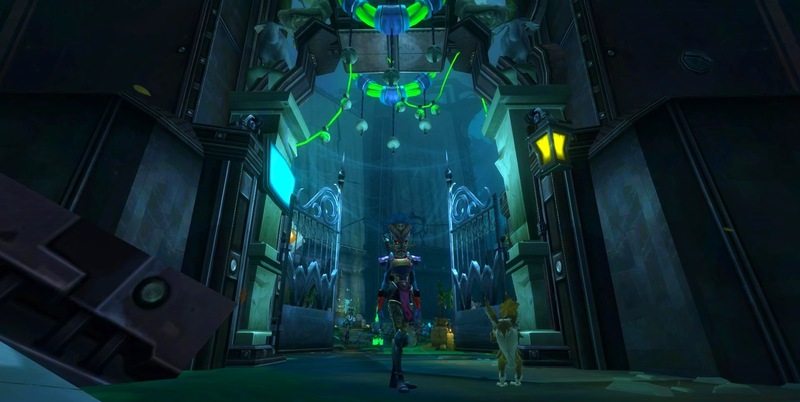 Any good intentions I may have had about giving WildStar:Reloaded a fair shake seem to have fallen under a bus. So far all I've managed is a daily log-in to click through the reward screen. That much I have at least managed diligently because the instant rewards are rather good, particularly the ones you get each ten-day, which include pets, mounts and skies for your house. For the first few days, as soon as I'd bagged the prize I made the hundred meter dash to my house so I could log out on my bed. Then I realized that every time I log back in I find myself standing outdoors by the teleporter so there didn't seem to be much point trying to get comfortable any more. I usually just log out where I'm standing meaning the entire visit takes less than a minute. Last night, though, for the first time I found myself sticking around for over an hour. The reason? Shade's End. 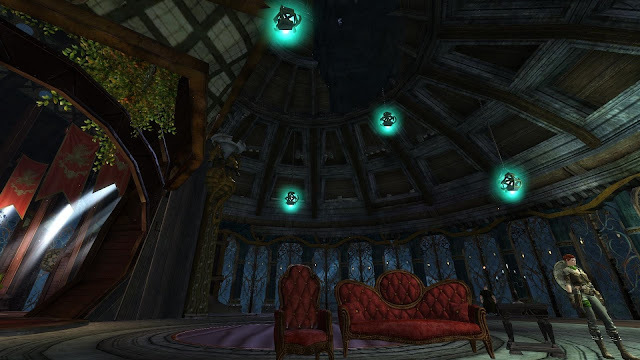 I've always been something of a sucker for MMORPG Holidays and while Halloween is by no means my favorite real-life festival (I doubt it would make the top twenty) I'm keenly aware that game developers take it very seriously and pull out all the stops. On first impressions I'd say Shade's End is a fairly typical example of the subgenre. Its strongest suits by far are the visuals and the storylines. I am a total ingenue when it comes to Nexus lore so I can't make a meaningful judgment on whether pumpkins and candles make or break internal logic but I can say that they look fantastic. The artists have done a bang-up job decorating the place, and while the tale of Angel and Jack Shade may not win any prizes for originality, it's well-told and mildly poignant. Of course, being a dirty Dommie, I only got to see Thayd, which is a badly-lit maze of ill-favored backstreets at the best of times. 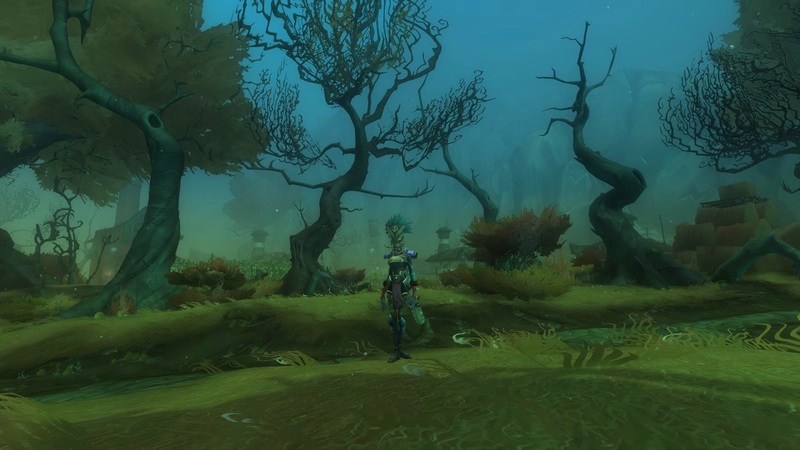 One real issue I do have with WildStar is just how dark and cluttered it is everywhere, not just in the city but in all the adventure zones too. I can't remember ever playing an MMO where the "open world" zones felt quite so claustrophobic. The art direction is very good but it could do with the editorial hand of restraint here and there. Less really can be more; I think that was firmly established long ago. With that in mind it must have taken some brainstorming to come up with a way to pile on more pressure and make things feel even more shut-in. The new Quiet Downs instance certainly manages it. 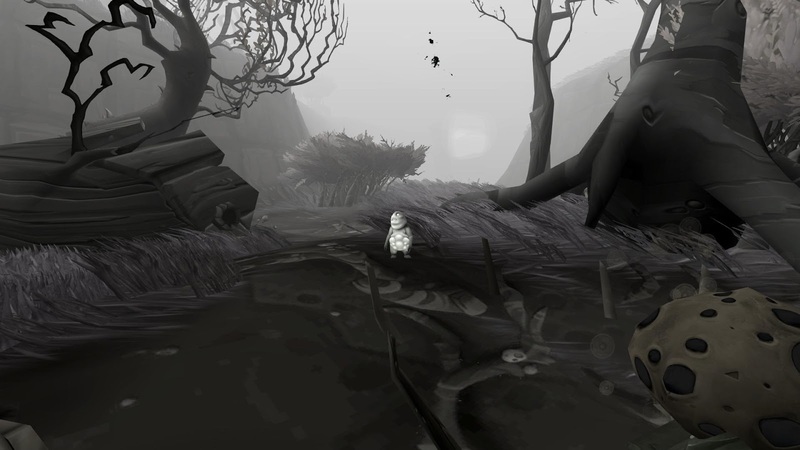 The instance starts in pitch darkness with a quasi-survival mini-game in which you have to navigate a dark forest using a very limited supply of torches. The torches cast light no further than your arm can reach and run out in about fifteen seconds so you can imagine how much fun that is. Luckily the dense undergrowth is ridden with Shadelings who quickly make you One Of Them and Shadelings can see in the dark. Once I'd been converted I just hung around in Shadeling form until I could see where to go and headed in the right general direction. I'm not sure it's the intended method but it worked well enough. The storyline, as I said, is unoriginal but enjoyable, at least as far as I was able to follow it. It does rely on some fighting and that proved to be a problem. The Expedition instance boosted my Level 19 Warrior to 50, which worked well enough until she needed to beat the Keyholder, the first Superior-rated mob. The scaling seemed off at that point and I wasn't able to solo it. By all accounts it's easy enough as a genuine fifty and/or in a duo or larger group so it hardly counts as a roadblock but as an only mildly intrigued casual visitor it was enough to send me back to Thayd to see what else was on offer. Ye gods, but Thayd was busy! All the new content is housed in, or begins from, a small area and it was teeming with people. So much so that I had real trouble finding the questgivers among the crowds. Eventually I loaded up with what turned out to be a very typical smorgasbord of MMO holiday fare. The handy Reddit thread on the event sums the selection up very well: "The quests involve simple tasks like picking up stuff around town or interacting with citizens." Yep, that about covers it. I knocked most of them off in a few minutes, which left me with enough of the event currency, Shade Silver, to buy a few not very interesting housing items. I resisted the temptation to spend what I'd got right away because the options available for a few silver more are much more appealing. Appealing enough, indeed, that it's odds on I'll be back to jump through a few more wisps and egg a few more hooligans over the next few days. The one innovation that Carbine have brought to the tradition is an attempt at an actual implementation of trick-or-treating that somewhat resembles what goes on out of game on October 31st. Syp has a good account of how that works but the gist is you put out bowls of treats on your housing plot and other players come and take them. Not seen that done before. I hope DBG, Trion, Square and all the other developers with visitable player housing are paying attention. All in all I thought it was a darn good effort. If WildStar was my focus game I'd certainly be grinding out those Shade Silvers. That full Jack Shade costume looks very tempting for one thing and I could do with a Gothic Gate - couldn't everyone? As it is Shade's Eve will have to fall in line behind Norrath's Nights of the Dead and Tyria's Shadow of the Mad King on my personal holiday calendar. There are things I want from those too and there are only so many fluff hours in the fluff day. Erm...well...Ravious is. Jeromai, not so much. Is anyone else still playing? Me, I'm more nervous than excited. Yes, there are some aspects of the New Order that I'm looking forward to - well, somewhat at least - as I mentioned a while back. I'm certainly happy to have new things to do, new places to explore, new mechanics to understand and all the rest of that Mom and Apple Pie Good Stuff so I guess I shouldn't complain. And it's not like I wasn't one of the people agitating for an expansion all along. It seems churlish to cavil and nitpick now. Okay, it's not exactly a gift horse, what with the the box fee and all, but still. So why are my overriding emotions ones of anxiety and apprehension rather than joy and anticipation? Partly it's that, for all the reveals and beta weekends and countdowns, I still don't really feel I know what to expect. It's not so much what's in the Heart of Thorns package itself. With only a few days to go we are, at long last, reasonably clear on that. No, it's more the effect this meteoric impact is going to have on the rest of the game. I foresee almost incalculable collateral damage to the experience of playing GW2 that has, more or less, kept me entertained and amused for most of my leisure time over the past three years. Although the Velvet Rope will be held very firmly in place to separate those who have stumped up the entrance fee and those who are keeping their hands in their pockets, this isn't one of those expansions you can easily choose to ignore. 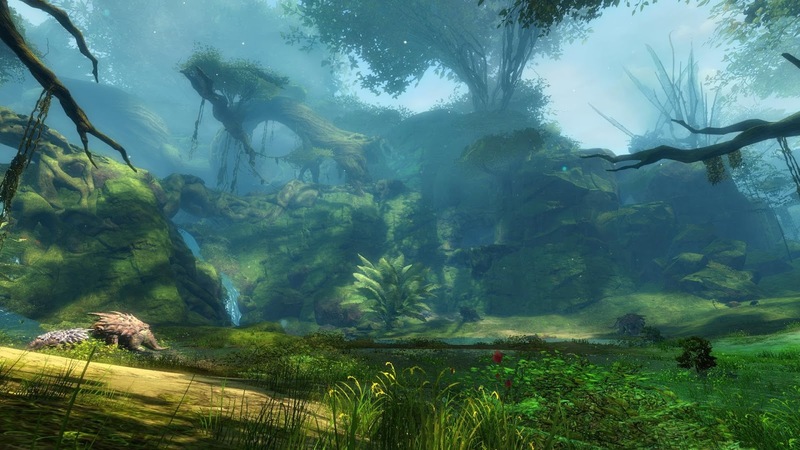 For a GW2 player who decides against buying the expansion, the HoT action may all be happening in a land far away about which you care little, but there's no chance you'll be able to carry on as though nothing was happening. Every aspect of the base game will be affected, directly and indirectly. There's the widely-expected creep towards Ascended gear as a baseline for one thing. 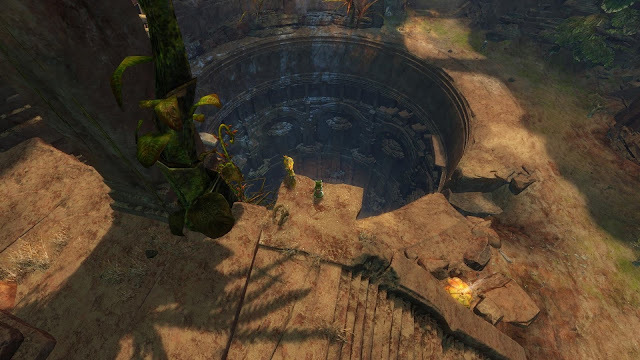 The developers have made it entirely plain that all of their future content will be set in, and will require access to, the Heart of Thorns zones. That will most likley mean Raids, which are, as far as I can tell, the only publicly confirmed post-HoT content we have been promised. Has anyone actually mentioned new achievements for HoT? Those Raids both provide and require Ascended gear. It would be surprising if the developers then chose to add further content without taking that factor into account. Since the the first tranche of Personal Story and open world content that comes with the expansion was produced prior to the introduction of Raids it may be feasible to complete it in Exotics but how long can that stand? Then there are the changes to World vs World. These are immense. It would be more than daunting enough if all that was happening on Friday was the replacement of the Alpine Borderlands with Deserts and Dinosaurs but there is much more to come to terms with than just a new set of maps. The changes to how Squads work will, alone, radically alter the whole experience. The intention appears to be to give Commanders the full functionality that Raid Leaders enjoy in other MMOs, allowing them not only to monitor the health and condition of every character in the squad but also to dictate formation and function. They also serve who only stand and haste. The Commander can make the groups and move individuals within them. If what you want from World vs World is the true feeling of being an interchangeable, disposable grunt in a great military machine, learning to follow orders without question and follow a single commander to the death without worrying your pretty little head over tactics, let alone strategy, then this is the very innovation you've been clamoring for all these years. If, on the other hand, you like to stand on the battlements chatting about sandwich fillings while flipping between maps to watch the ebb and flow of the battle before deciding which Commander to honor with your presence until you lose interest, it may not be quite the kind of quality of life improvement you had in mind. How many Commanders will welcome tag-alongs who decline to join their Squads remains to seen, although looking on the bright side there's not much they can actually do to stop you just running along in the pack. Not being in Squad may in the end be nothing more than the old not being in Teamspeak. Add to that the almost universally reviled decision to change the weekly reset from Friday to Saturday plus the integration of the new Keep, Siege and Guild Claiming mechanics into the one remaining non-desert map, Eternal Battlegrounds, not to mention the integration of the Legendary crafting path and other PvE elements and it's pretty clear that WvW as we have known it is over. 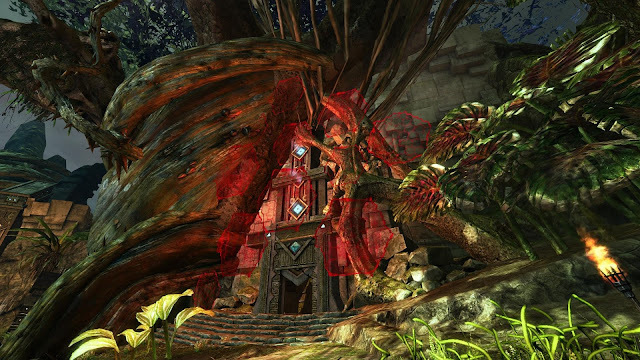 Whether WvW 2.0 will provide anything like the entertainment value of the original remains to be seen. Even if it does I'm going to miss those maps. Then there's the economy. There was a big row in map chat at Jormag last night over whether Anet were wise to hire an in-house economist in the first place. Well, I say "row". There was one "Ivy League Economics Graduate" bigging up the discipline and the entire rest of the map shouting him down. I'm with the baying mob this time. I have no respect and little affection for MMO "economies" in the first place. I'd rather do without direct or indirect player-to-player trading at all than have a full, free market, whether "adjusted" by a professional economist or not. If we have to have game economies I'm all for developers intervening wholeheartedly to control prices for the health of the game and to increase the entertainment value for the players but that, very definitely, is not what John Smith is there to do. 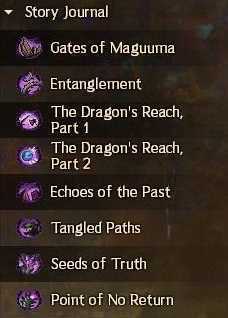 Uh...does no-one do Tequatl any more? A close reading of his recent post makes it very clear that achievement of some notional, theoretical economic model for the game trumps every other consideration. Fun and entertainment really do not come into the equation at all. Even so, Smith himself makes it quite clear such fine control is beyond him: "The combination of our changes and our new systems is sure to make everything go a little wild...Prepare for some short-term instability and a lot of big changes...we’ll be watching closely and updating constantly". Or, in other words, we're going to press this big red button and see what blows up then we'll try and stick the bits back together later. These are just the Big Ticket changes. There will be far more that we haven't thought about or talked about. 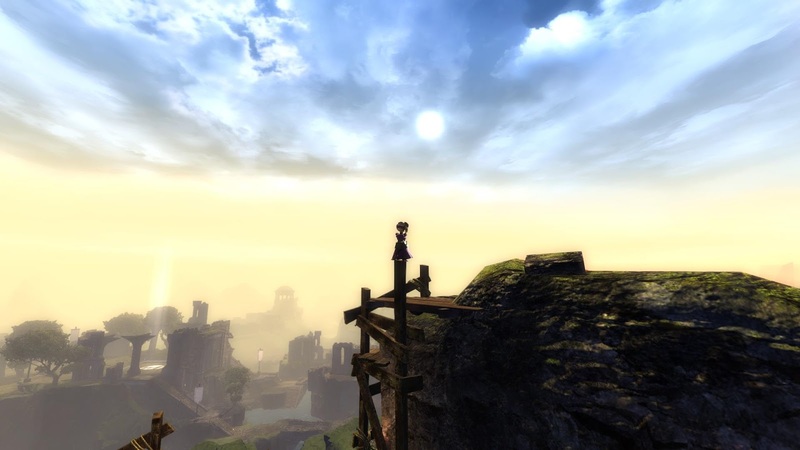 The changes to Map Rewards in Pact Tyria may radically affect which parts of the world are heavily populated or shunned. An influx of players with the new, extremely powerful, Elite Specializations from HoT will surely change the experience of all shared content for those who don't have access to them. 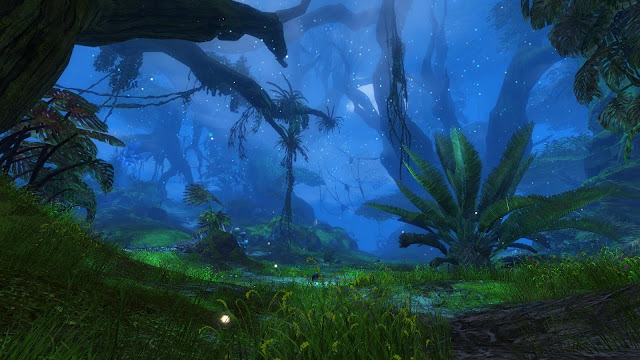 Even such apparently unconnected areas of the game as World Bosses and Dailies may require or receive a revamp to fit in with the prevailing zeitgeist. There is so much we just don't know even now. My strong feeling is that, given the very limited amount of true public testing any of this has received so far, this will be a chaotic launch. I'm working Friday but I've taken Saturday off to give me a three-day weekend. I'm not expecting to get to play much but if nothing else it should give me something to write about.